The Adventist school in Maruševec began in 1969. The school offers primary, secondary, and college education. For many years, classes were held in the Maruševec Castle, which the communist government rented to the Adventist school. Joshua is 11 years old and lives in Croatia—a country in eastern Europe [locate Croatia on a map]. From the time he was a baby, Joshua’s parents took him to Sabbath school. And long before he went to school, Joshua was already playing the violin. For as long as he can remember, he has had two great loves—God, and his violin! “I told her that God is near to her and all of us,” said Joshua. The girl asked Joshua for a Bible and soon received one. “Now she and her mom are coming to Pathfinders with us, and her mother also comes to a women’s group at the church!” Joshua says with a smile. One day, Joshua heard his parents talking about a boy who was very sick. The boy had a brain tumor and his family couldn’t afford to pay for the operation that he needed. “OK,” said his mother, but she was wondering to herself how she could organize it. That wasn’t a problem, however, because Joshua organized everything himself! He told his friends at the music school about his idea, and soon 15 young musicians were eager to help by playing in the concert. Joshua also talked with an Adventist pastor who was willing to present short devotionals between each of the 15 musical pieces. Soon, posters advertising the special benefit concert were seen all over the village of Maruševec and at schools in the area, inviting people to come to this special program. The concert was held on June 13, 2015 at the Seventh-day Adventist Church on the campus of the Adventist secondary school in Maruševec. About 300 people came to the concert, most of whom were not Adventists. 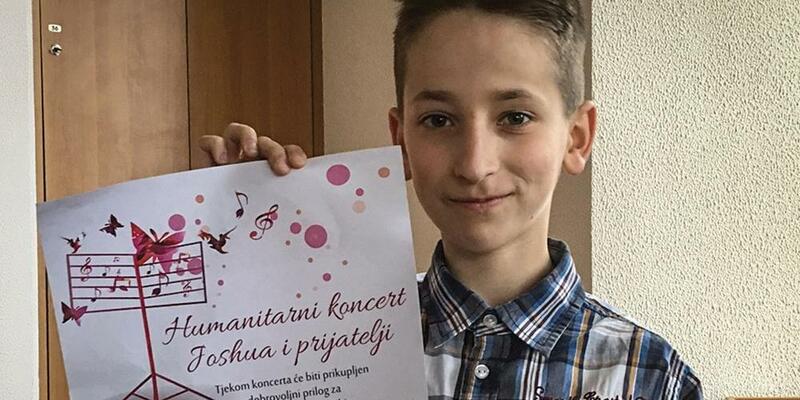 Joshua and his friends were delighted when they learned that their concert raised 8,600 Croatian kunas (pronounced QUE-nuz)! That’s more money than an average person in Croatia makes in a whole month! Even though Joshua and his friends didn’t personally know the sick boy, they were happy that they were able to help him and his family. Joshua is happy to use his love for God and violin to share God’s love with as many people as he can. Now Joshua is planning more concerts to help other children in need.